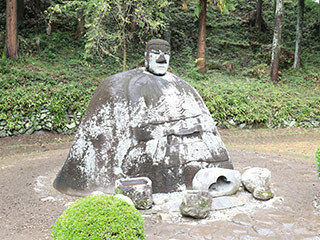 The Stone Buddha of Banji (万冶の石仏) is located in Shimo Suwa, Nagano Prefecture. The legend said this stone Buddha has the power to heal all diseases. Because of the unique figure, the famous Japanese Artist, Okamoto Taro, loved this stone statue. There are restroom and parking. 1. use JR Chuo Line to Shimosuwa Station. In 1661, the feudal lord of Suwa Tadaharu tried to contribute to the Torii gates of Suwataisha Shimosha Harumiya. When the Stonemason tasked with the job of building the Buddha struck his chisel into the enormous stone found in the area, bloom started flowing from the stone. It is said the startled mason stopped constructing the Torii gates a chiseled a likeness of Buddha Amitabha instead. It is characterized by a humorous expression and the unbalanced feel of an enormous natural stone body paired with a tiny neck. Okamoto Taro, a revered Japanese artist, Loves the Stone Buddha so much that he routinely visits and pays his respects here at this stature. Pray "Yorozu Osamarimasu Youni." Or, please heal my sickness. Walk around it clockwise 3 times. Pray "Yorozu Osamarimashita." Or, I'm cured.